Wilson Stage through June 25. 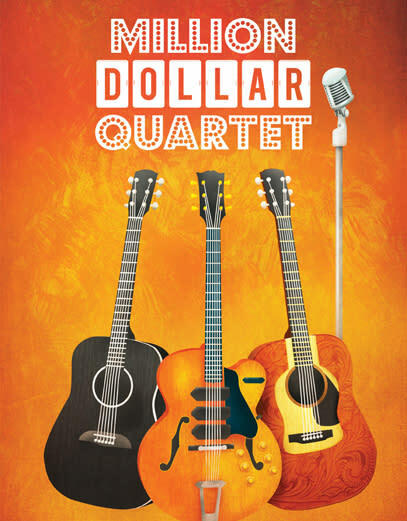 Geva Theatre Center closes the 2016-2017 ESL Wilson Stage Season with Million Dollar Quartet with book by Floyd Mutrux and Colin Escott, based on an original concept by Floyd Mutrux and inspired by the music of Elvis Presley, Johnny Cash, Jerry Lee Lewis and Carl Perkins. Million Dollar Quartet is directed by Hunter Foster and will be performed in the Elaine P. Wilson Stage from May 30 to June 25. On December 4, 1956, four young musicians got together at Sun Records in Memphis for what would become one of the greatest jam sessions ever. Put on your blue suede shoes and join Jerry Lee Lewis, Elvis Presley, Johnny Cash and Carl Perkins for the recording session of a lifetime. Loaded with classic rock ‘n roll hits such as “Great Balls of Fire,” “Sixteen Tons,” “I Walk the Line,” “Hound Dog” and many more. Created by film producer, writer and screenwriter Floyd Mutrux, with a book by Mutrux and rock ‘n’ roll historian Colin Escott, the worldwide phenomenon that is Million Dollar Quartet premiered at Florida Seaside Music Theatre in 2006. Following productions at the Village Theatre in Washington State and a limited run at the Goodman Theatre in Chicago, it transferred to Chicago’s Apollo Theatre 2008. It celebrated its 2500th performance there in September 2014. The show closed on January 2016 and is ranked as the third-longest running show, in terms of calendar span, in Chicago Theatre history. In 2010 it opened at Broadway’s Nederlander Theatre where it ran for over a year and was nominated for three Tony Awards including Best Musical and Best Book of a Musical. The Off-Broadway production opened in 2012 and ran for a year at New World Stages. The West End production of Million Dollar Quartet opened in February 2011 and ran at the Noel Coward Theatre for nearly a year. The show has toured the US, Canada, Australia, New Zealand and the UK. “Sun Records,” an eight-part TV series based on Million Dollar Quartet, aired on CMT/Viacom in February and April of 2017. Making their Geva Theatre Center debuts in Million Dollar Quartet are Alyssa Gardner (Million Dollar Quartet, Cinderella, Jesus Christ Superstar and Joseph and the Amazing Technicolor Dreamcoat at Casa Mañana in Fort Worth) as Dyanne; Taylor Gray (National Tour of Million Dollar Quartet) as Jerry Lee Lewis; Dan Leali (Grammy nominee for his performance on Liquid Soul’s album, Here’s the Deal) as Fluke; James Ludwig (Original Broadway cast of Monty Python’s Spamalot and Little Shop of Horrors) as Sam Phillips; John Michael Presney (National Tour of Million Dollar Quartet and ABC’s “Betrayal”) as Carl Perkins; Trent Rowland (Million Dollar Quartet at Casa Mañana and the feature film Carol with Cate Blanchett) as Elvis Presley and Sky Seals (Million Dollar Quartet at the Segal Centre in Montreal, The Repertory Theatre of St. Louis, the Actor&apos;s Playhouse in Miami and the Westchester Broadway Theatre) as Johnny Cash. Josh Kerr returns to Geva as Brother Jay where he has played bass for A Funny Thing Happened on the Way to the Forum, Little Shop of Horrors, Avenue Q, Next to Normal, Company, The Music Man, Five Course Love, Sweeney Todd and Cabaret. Hunter Foster makes his directing debut at Geva with Million Dollar Quartet. He is an Artistic Associate at the Bucks County Playhouse where he has directed Company, Ain’t Misbehavin’, The Buddy Holly Story, National Pastime, The Rocky Horror Show (2013, 2014 and 2016), Summer of ’42, It’s a Wonderful Life and Clue on Stage. Other directing credits include Cabaret, My Fair Lady (Cape Playhouse), Grease (North Carolina Theatre), Monty Python’s Spamalot (Casa Mañana) and he has directed productions of Million Dollar Quartet for the Ogunquit Playhouse, Gateway Playhouse and the Westchester Broadway Theatre. As an actor, Mr. Foster has appeared in Geva productions of Monty Python’s Spamalot and Sylvia and is a Tony Award nominee for his performance in the revival of Little Shop of Horrors. Other Broadway credits include Sam Phillips in the original cast of Million Dollar Quartet, The Bridges of Madison County, Hands on a Hardbody, The Producers, Urinetown, Les Misérables, Footloose and many more. The design team includes Adam Koch (scenic design), Amanda Doherty (costume design), Kirk Bookman (lighting design) and Ian Hildreth (sound design). Music Director is John Michael Presney. The 2016-2017 Wilson Stage Series is sponsored by ESL Federal Credit Union. The Honorary Wilson Stage Series Sponsor is Dr. Dawn Lipson. Million Dollar Quartet is produced with support from Lead Co-Producer The Boev Clinic; Associate Producer Woods Oviatt Gilman LLP; Assistant Producer Gray Locey, CPA, P.C. and Media Sponsors News10NBC and Legends 102.7. For photos, or to arrange interviews, please contact: Dawn Kellogg, Communications Manager, (585) 420-2059 or email: dkellogg@gevatheatre.org. *Open captioning is provided with support from Hearing Loss Association of America – Rochester Chapter.